My First Giveaway - Typo Lightbox ! I'm super excited to be sharing my very first blog giveaway! I have been wanting to do one for ages, and I thought that hitting 250 followers on bloglovin' would be a perfect reason to celebrate! 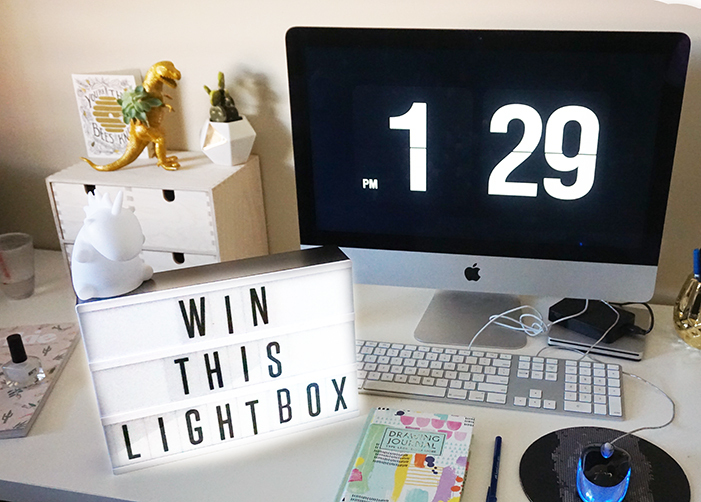 Typo has these gorgeous lightboxes (RRP $70 AUD) that come with 70 letters, numbers & symbols so you can write almost anything you want and have it shine up in lights! 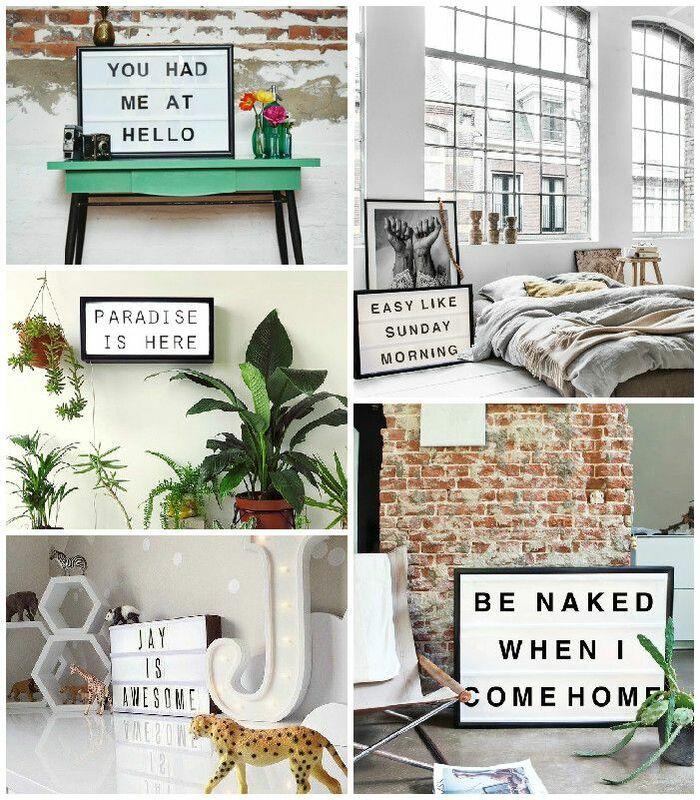 Lightboxes are gorgeous pieces of decor that can suit almost any style of room. Here are a few inspiration photos I've gathered from Pinterest of what some people have done with their own lightboxes. It's very simple to enter, just use the little Rafflecopter gadget below. The Giveaway will run from the 1st of July til the 31st of July. The best news of all, this Giveaway is INTERNATIONAL! That's right! All my lovely readers in the US & the UK can enter! HELP: To follow on bloglovin you can click the little black rectangle button that says +BLOGLOVIN right underneath my name here. If it's a tick, you're already following! Easy peasy right?? Great giveaway, these are so pretty! Love this! Such a great giveaway and congrats on your milestone! Oh my gosh that is so awesome and would make hella interesting pictures. Wow I haven't seen these before! What a lovely giveaway and well done on reaching 250 followers! Yay, congrats on 250! The lightbox looks so cool, omg. Good luck to everyone! This is exciting! Congratulations, my friend! This is such a cool giveaway! So exciting! That lightbox is so unique and amazing! Congrats on your 250th follower as well as your first giveaway! I want to do one so badly as well but I have no idea how. Let me know how yours goes. Anyway, I love the idea of decorating with this. It has a cute shop-look to it (like those signs facing towards streets to advertise the latest deals). I love the one that says, You Had Me At Hello :) Good luck with your giveaway and again, let me know how yours went! I love this light box - entered! Congrats on reaching 250 followers too! That sign would look totally effing rad in my room!! YA YA! Fabulous giveaway! That light box is absolutely gorgeous! Agh I've not seen one of these before but I really want one now! I've scheduled to share this on my FB page on Thursday. Thanks heaps for letting me know about it, T! Congrats on your 250 bloglovin' followers milestone. As I type this you are only 5 away from 350 now!! I would love a lightbox, my brain is swirling with all the ideas I could use it for...inspirational quotes, birthday parties, fun messages, pleas to the kids to pick up their towels and dirty clothes! Love your collection of inspiration. What a great giveaway! congrats on your followers! Cool stuffs , i just entered the giveaway. Congrats on hitting 250 followers, you totally deserve each and every one of them (and tons more)!! Damn I wish I saw this earlier, following you on bloglovin' now anyway.